The NBC Bay Area Investigative Unit continues its reporting on the effects of illegal pot farms at National Parks and on tribal land: this time, exposing the violence and resulting fear. The majority of the 2,381 people arrested for marijuana cultivation on U.S. Forest Service public lands in California over the past five years are members of massive organized crime groups, according to law enforcement, and they are causing safety issues for park goers, hikers and locals. Many of those arrested are armed, dangerous and inching closer to hiking trails and communities. California leads the nation with marijuana grows on National Forest Service land, with 12 million plants found from 2008-2012. The NBC Bay Area Investigative Unit first exposed the deadly environmental effects of these illegal pot farms last month. However, the illegal grow sites are endangering more than the environment. The Investigative Unit rode along on a bust by Fresno County Sheriff’s Department’s Marijuana Eradication Task Force, just over the hill from King’s Canyon and Sequoia National Park. The team confiscated 299 plants and found several shotguns. “There are armed people patrolling those grow sites, and you have people up there trying to steal that marijuana, so you have almost in a gun battle,” Ko said. He said that includes six murders in 2012. According to Ko, traffickers grow thousands of plants at a time then sell it for up to $50 per gram. And they want to protect those valuable crops. Since 2007, the U.S. Forest Service has found 574 firearms and weapons on public land. Many of these weapons are found at large marijuana growing operations. 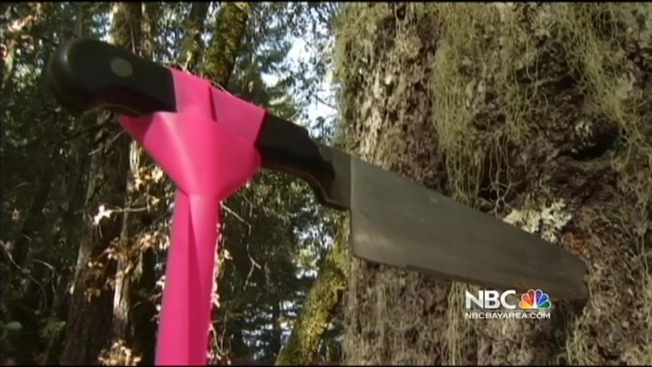 The Investigative Unit went along for the cleanup of a busted site situated deep in the Six Rivers National Forest, near Eureka, where volunteers found sleeping bags, water lines and pipes with water in them, and a knife in a tree. During the raid of the site back in August, agents found more than 5,000 plants. And, protecting the crops was a 21-year-old Mexican foreign national with a loaded .9mm semi-automatic handgun. “We see more and more people in the grows armed with side arms or rifles,” Darryl Rush, assistant Special Agent in Charge with the US Forest Service, told NBC Bay Area. Rush led the clean-up of the site. Unlike decades ago, most grow operations are controlled by Mexican drug cartels because, he says, it’s cheaper to grow marijuana in the U.S. than to smuggle it. And that is causing concern among hikers and locals. “[There is] the potential that I can be attacked,” said Dawn Blake, a member of the Hoopa Valley Indian Tribe outside Eureka. The tribal land and the nearby Sierra National Forest have become overrun by illegal pot growers, and going into the forest is frightening. “They are armed. I don't know what their frame of mind is. I know that they have a resource to protect,” Blake told the Investigative Unit. “It has an impact by folks not being able to do customs from thousands of years,” Ryan Jackson, a councilman for Blake’s tribe, told NBC Bay Area. He thinks the fear of growers is also keeping tribe members inside and unable to do many sacred rituals. Jackson believes the growers use the land because they can exploit resources and easily hide from authorities. “They are not paying for water,” he said. “They are taking a stream, a natural spring or creek, and using that to water to grow marijuana, which in turn is depriving something else in the natural environment of life-sustaining water. Law enforcement says, if you’re hiking and you see a water line, report it, since it is very likely it’s connected to a grow site.